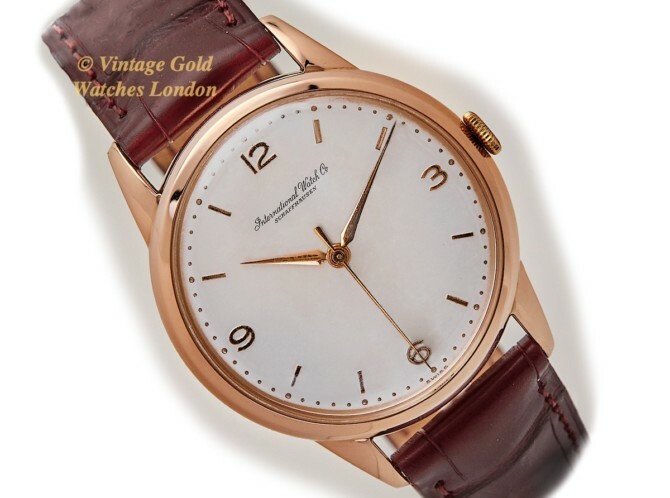 It is said that owning a vintage IWC is something everyone with a serious interest in vintage watches should aspire to. A strong statement perhaps, but a little time spent researching IWC and their ’50s & ’60s watches, will very likely lead one to the same conclusion. In essence, this is because during the 1950s and 1960s, IWC determined they would manufacture some of the very best watches ever made and quite simply, this is what they achieved! The craftsmanship, technical excellence and sheer beauty of their exquisite movements and cases, manufactured during the ‘golden age’ of watch-making, has never been beaten – perhaps equalled occasionally, but never beaten! An IWC is often referred to as a ‘watchmaker’s watch’. This is simply because watchmakers love them, both to work on and to own. This is due to the design, technical excellence and in particular, the sheer beauty of their watch movements. The watch here is quite rare, being both oversized at 36mm diameter and made of Pink Gold. Not to mention of course, the amazingly good condition of this watch, but this is just what lies on the surface. Underneath we find a truly iconic movement, the Cal.89 which has certainly stood the test of time, remaining in production for both civilian and military use for over 40 years! Many consider the IWC Cal.89 to be one of the great manually wound movements of the 20th century. The movement was originally developed in 1946 by the genius in watchmaking, Albert Pellaton, who designed this movement to meet the most demanding and highly rigorous specifications of the British Ministry of Defence. Each movement went through a 44-day testing period in five positions and ranging in temperature from -5° to +46° C. It was produced for military use continuously for over 30 years and became ‘The standard’ for military grade timepieces. The movement also became an IWC mainstay for the commercial market, remaining in production until the mid-1990s. We have already touched on the craftsmanship and sheer beauty of IWC movements. Some examples of the extra care and attention are the finishing applied to the bridges or plates, characterised by a series of arc-grained bars etched lightly onto bridges or plates, creating a wave-like effect. This is known as a ‘Geneva Wave’ finish. Furthermore, all the edges of the plates are beautifully bevelled which is very difficult and time-consuming to achieve. Lastly, each of the ruby jewels is set in brass ‘chantons’ which are then screwed into the plates rather than setting the jewel directly into the plates. This is the kind of detail which sets IWC apart. The movement has been fully overhauled by a Master Watchmaker. This means stripping the watch down to all its component parts, careful inspection under high magnification, replacement where necessary with only genuine IWC parts, then careful reassembly and adjustment before final calibration in 5 positions. This watch therefore winds, sets and runs accurately and reliably within +5 seconds per day, averaged over 5 positions. Please bear in mind this is outstanding for any watch of this age. We are therefore highly confident in offering a 1-year warranty with this watch movement. The movement is all signed correctly, ‘International Watch Co’ and ‘Swiss’ with both the Calibre number and the Serial Number 1409863 which date this watch to 1956. *Please note – our 12 months’ warranty is only included if the list price is paid. The heavy, high quality oversize Pink Gold case carries elegant swept back lugs and measures 9mm in depth and 36mm in diameter, not including the crown. Pink Gold vintage watches from this period are always rare as this kind of gold was not used as often in the 1950s and ’60s as it is today. The watch case is in truly spectacular condition and presents beautifully on the wrist. The high polished full thickness case-back has never been inscribed. The case-back, bezel and main case body are all in beautiful condition with no scratches, dings or other damage visible to the naked eye, therefore the case has simply required a professional clean and gentle hand-polish, to bring back the almost new look of the watch! Inside the case-back we find the case is all correctly signed ‘International Watch Co’ ‘Swiss’ with the IWC brand, Swiss Geneva 18K hallmarks and the Case Serial Number 1432933. This is a beautifully understated dial in slightly Off-White with matching pink gold hour indices and the original, restored pink gold ‘Lance’ hands. This classic 3 – 6 – 9 dial is signed with the infinitely more attractive earlier International Watch Company, Schaffhausen signature. This is the original dial which has been sympathetically restored to the very highest standards by the best vintage watch dial restorers in the UK. The watch is fitted with a very high quality Hirsch London Alligator strap fitted with a vintage gold plated IWC buckle. If a different size colour or style of strap is preferred, please let us know and we will do our best to oblige, free of charge. We carry tan, conker, dark brown and black in stock and in plain padded leather, or crocodile skin or lizard skin, in standard, large and extra large sizes. Although there are no original papers with the watch, the numbers and markings are all correct, dating this watch to 1956. A detailed written receipt with 12 months warranty* and a separate insurance valuation for the replacement value will be provided at the time of sale along with our unique ‘Lifetime Authenticity Guarantee’ which states: “If this watch proves to be anything less than totally authentic, or not as described, Vintage Gold Watches of London will offer you a full refund at any time”. The presentation box shown will also be included in the sale. This is a truly first class example of a 1956 Pink Gold IWC dress watch which is ready to wear and completely practical for everyday use. If treated with care, this will make an excellent investment and heirloom piece. IWC will always command huge respect in the high-end watch market, and consequently, prices are always rock solid. We are therefore sure this will make a great acquisition for any collector or very proud wearer to treasure and enjoy! A word on our prices – We always try our hardest to acquire the very highest quality watches we can find, before restoring them to the highest possible standards. We then offer these at the fairest prices we can, taking into account our pre and post sales care and service. This approach means we will never be the cheapest, but nor will we be the most expensive. Indeed there are some well known stores in West London which are highly successful charging between two to three times the price you see here. We therefore consider our prices to be very fair, given the quality and condition of watches we have to offer. We are happy to accept PayPal as this is the quickest and safest method of payment. We also accept all cards. However, if you would like to pay by UK cheque or by UK bank transfer we will be pleased to assist you with this and pass on a 3% saving to you. Similarly, if you wish to pay by International SWIFT or Bank Wire Transfer we will provide you with our BIC / Swift number and our IBAN number. Please note, we welcome part exchanges and also outright purchases of similar watches. We also offer Watch Service, Watch Repair & Watch Restoration, please see here.